To celebrate their centenary Chevrolet are bringing two very different concepts to the Frankfurt Motor Show in September – the small, sporty, open-topped Miray and the big, tough looking Colorado Rally Concept. The Miray is a small, sporty car. 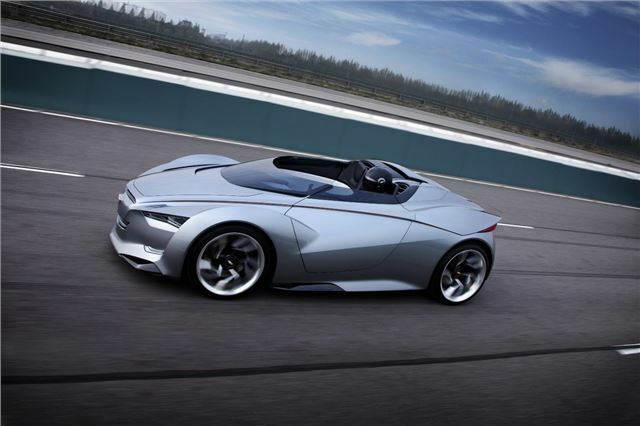 The name ‘Miray’ is Korean for ‘future,’ and it seems an appropriate title for the car, which is powered by a ‘mid-electric’ system made up of two electric motors coupled to a 1.5-litre turbocharged four cylinder engine. The electric motors power the car in town, providing quick acceleration and zero-emissions in urban driving. When the driver wants more performance the 1.5-litre engine combines seamlessly with the electric motors, and the drivetrain can be switched from front- to rear-wheel drive. A dual clutch gearbox provides speedy gear changes and reduces fuel consumption, as does an integrated stop/start system. The exterior styling is reminiscent of fighter jets, but with touches from other famous Chevrolet models including the Corvette and older American classics like the 1963 Monza SS. The signature dual-port grille is present and correct, along with LED daytime running lights. The bodywork is made from lightweight carbon-fibre reinforced plastic (CFRP) and carbon-fibre. The wheels are 20-inch at the front and 21-inch at the rear, with a ‘turbine’ design to evoke movement even when the car is stationary. The interior is as radical as the exterior. Leather, brushed aluminium, white fabrics and ‘liquid metal’ surface treatments are abundant, and the passenger compartment follows the design of the Corvette’s – it’s driver focussed while still involving the passenger. Retractable rear-view cameras replace traditional mirrors, and a forward facing camera integrates with the GPS system to provide information overlaid onto real-time video. The Colorado Rally Concept previews the next generation Chevrolet Colorado, a mid-size pickup truck sold mainly in the US. The Concept version features a double cab and sits over an all-wheel drive chassis. Power comes from a 2.8-litre turbo diesel engine. It was designed with rally raid motorsport in mind and features height-adjustable suspension and Fox Racing Shox shock-absorbers to help it cope with tough terrain. Externally the design features headlights with LEDs, the signature front grille and muscular bodywork. Inside the cabin things are designed to be functional and ergonomic. The seats are lined with neoprene and the upper dash with leather. The dark design materials are contrasted against a silver-painted internal roll-cage and metal details. There is a ‘high-performance steering wheel’ designed to help the driver travel over rough terrain, and, thanks to integrated tachometer LEDs, to change gear at the right time. Further raid rally touches include a fire-extinguishing system, and sat-nav system directly in front of the passenger’s (or navigator’s), seat.